Imagine this: You are meandering through a crowded park in the sweltering Florida heat, trying to fit in all of your dining and gift-shopping before hitting up your next attraction. As your scheduled time nears, your family heads over to an assigned boarding spot close by; rather than hoofing it all the way to your next ride, your ride vehicle comes to meet you — transporting you through the park and directly onto your next attraction. Autonomous vehicles often come up in news stories in the form of driverless cars, trucks, and buses. While that technology seems to be progressing, there are inherent difficulties in having an automated system navigate the complex system of roads that comprise the average major city. It would be a lot easier to get autonomous vehicles to navigate properly if they were in a small area, with clearly defined routes and boundaries, and without other human drivers to add unexpected variables — say, a theme park. Amusement parks or similar entertainment facilities may move people and goods in a variety of ways within a park environment that is closed to outside vehicle traffic. However, vehicle transportation within a park is complex. Pedestrian paths are often closed to motor vehicles. Park shuttles may operate on set paths within the park, but these may require guests to wait for the next shuttle. Further, guests often have overnight accommodations that are outside of park boundaries, which discourages back-and-forth trips to drop off unneeded items. The first application Universal outlines is a basic in-park transportation system, where guests would go to a boarding point and activate a device “similar to elevator call buttons” which would activate a vehicle and dispatch it to that boarding area; it’s also possible that requests could be made through a mobile device. The vehicle could have a control panel giving the guests an option of destinations to pick. In one example, when a guest has a reservation or return time, the guest location is tracked as they engage in other entertainment opportunities. 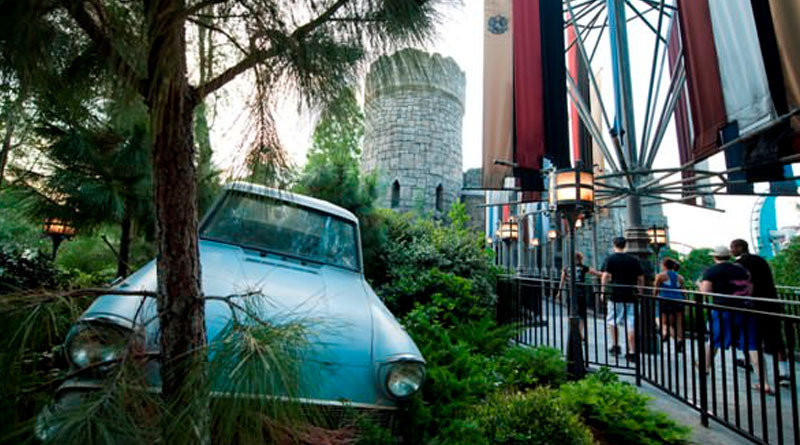 The autonomous vehicle arrives at the guest location in advance (e.g., within a predetermined time window before the guest’s turn to ride the ride comes up), whether or not the guest has requested vehicle transportation. The ride that comes to pick them up for their reserved attraction may be themed to that attraction or the general park area, so it’s more easily distinguished from others and adds to the immersion. For instance, if you had a reservation for a Jurassic World ride a jeep reminiscent of the iconic Jurassic Park transports might show up, or even a round see-through enclosure as seen in Jurassic World. 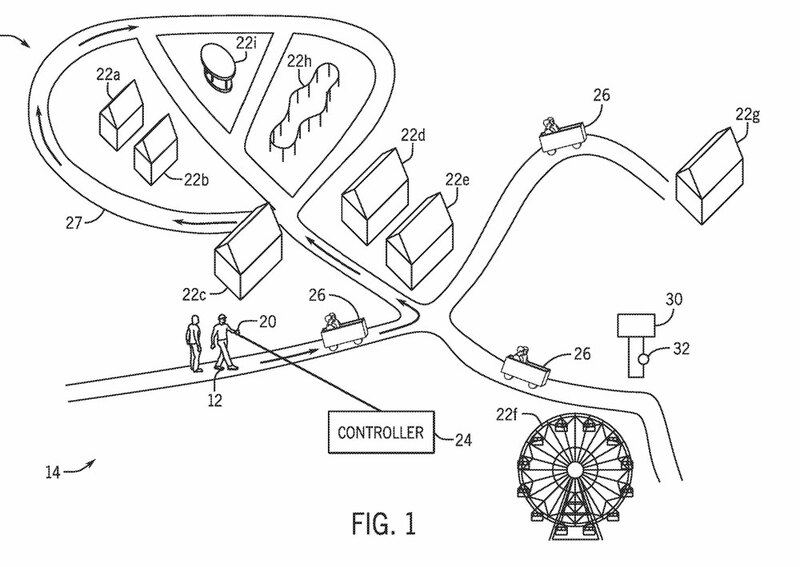 These rides may provide some attraction elements themselves, interacting with “sets, scenery, and mechanized equipment” that it encounters while travelling on a predetermined path. Next the document notes that the same system could be used for non-human cargo. A guests could conceivably purchase merchandise, request a vehicle, drop it off (or other personal belongings) for later retrieval, and go about their day without an excess of baggage weighing them down. It might also be used to deliver said merchandise or other items to the guest’s resort room. Along with transporting objects for guests, the vehicle could also be programmed to take props or equipment to scheduled shows and performance around the park, making setup and removal much quicker. 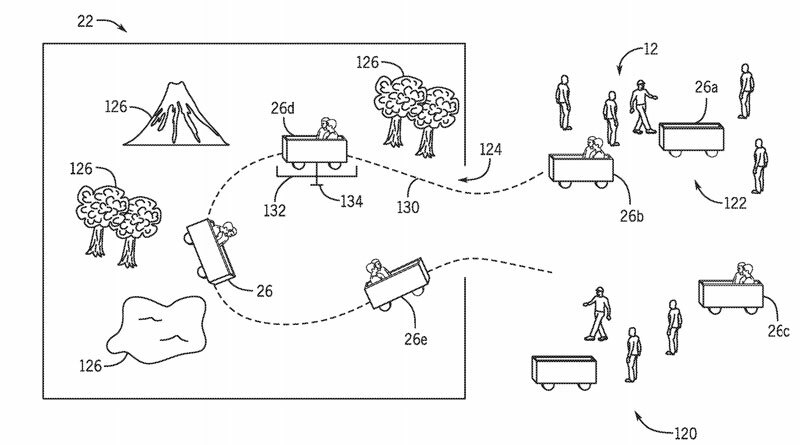 The ability for guests to summon a vehicle that would pick them up, take them to an attraction, link to the track of that same attraction, and transport them somewhere else after it was over would be an absolute game-changer in the theme park industry. Whether the ride vehicle would be compatible with only a single attraction or multiple would almost be moot, as the very dynamic of riding to your attraction and on your attraction without ever leaving your vehicle would be an incomparable experience. Another possibility is that these vehicle would serve as a mobile loading station for an attraction. They could roam the park until enough guests have boarded to fill it, drive straight to the attraction, and link up to the track as a ride vehicle — meaning no long waits in a stationary queue for those passengers. As must always be stated, the existence of an application does not guarantee a patent’s approval, and the existence of an approved patent does not guarantee the associated technology’s implementation. We may never see automated ride vehicles traveling to pick us up and take us on an adventure; this is a pretty ambitious idea. 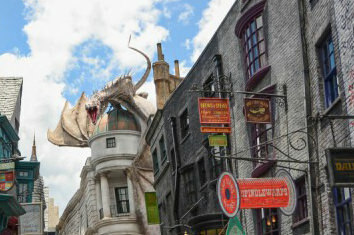 One thing is for certain though: If Universal manages to be the first in the industry to add this component into the theme park experience, it will cement a reputation for bold innovation and set an incredibly high bar for its competitors to leap.